AV Installs Bespoke Home Projector Installation Service offers a complete cable free solution, our expert engineers will ceiling mount your projector and conceal all the cables running back to your auxiliary equipment. Specialist fixings will be supplied to provide a secure projector mounting the engineer will then be precisely align the projector to the screen or projection surface. The advantages of the bespoke service are there is no visible cable management trunking; all cabling is concealed in cavity’s or chased into solid walls. This service is suitable for all domestic ceiling and wall types, if the walls require chasing then all repair work will be completed as part of the service. All cables will exit a plain white brushed AV outlet plate behind your existing auxiliary equipment. Next Av Installs will connect all your home entertainment devices to the projector and configure the projector to the ambient lighting conditions as well as optimise for the best possible image reproduction. Once the system is tested AV Installs will give a full demonstration of how to use your projector in conjunction with your other equipment, if you have any question the engineer will be more than happy to help. 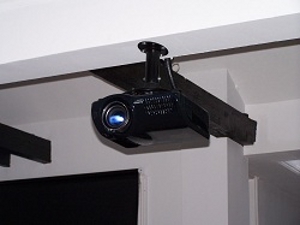 The bespoke home projector installation service is fixed price subject to a free of charge telephone survey, we may request some additional photos or information on what way the ceiling joists run. Further to a successful phone survey AV Installs will then email over an official quote for the installation along with our terms and conditions. All install services are covered by a full twelve month warranty along with a customer satisfaction sign off form. AV Installs is a Northamptonshire Trading Standards Approved Buy With Confidence Member and only uses its own engineers which are CRB checked.